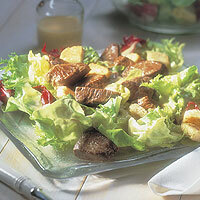 Creamy Dijon mustard compliments the nicely seasoned beef tenderloin tips in this salad. stir-fry 2 to 3 minutes or until outside surface of beef is no longer pink. Remove. Repeat with remaining beef. Season with salt and pepper. Toss greens with 1/2 cup dressing in large bowl; place on platter. Top with beef and croutons. Serve with remaining dressing.